Nature’s Sunshine Uña de Gato (Cat’s Claw) is the equal of the most popular immune-boosting herbs such as echinacea, golden seal, pau d’arco, garlic, and eleuthero. It also contains properties similar to shark cartilage and caprylic acid. 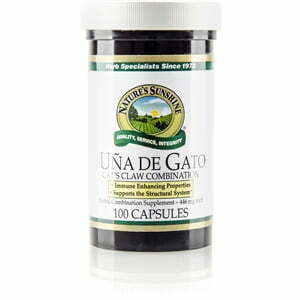 Uña de gato nourishes the immune system, the digestive system, and the structural system and provides benefial alkaloids. 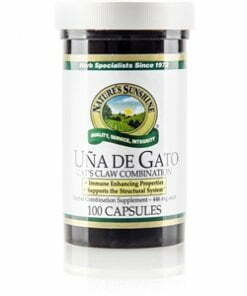 Nature’s Sunshine Uña de Gato is blended with astragalus and echinacea and comes in 300 mg capsules. Instructions: Take one capsule daily with a meal. For best results use with Protease Plus. Cellulose (plant fiber), magnesium stearate (vegetable), kosher gelatin, and water.